Vedauwoo is a very impressive park full of Sherman Granite rocks, piles of rocks and mountains of rocks in south-eastern Wyoming, between Cheyenne and Laramie - just a 1-hour drive north-west of Fort Collins, Colorado. The name Vedauwoo comes from the language of the Arapaho, who call this part of the world "Land of the Earthborn Spirit." Because this week is the 4-year anniversary of this weekly 1-minute web series, I wanted to do something special. So my best friend Erik Jürgensen, who is currently visiting from Hamburg, Whiskey and I decided to drive to the nearest state: Wyoming. Originally, I had planned to put together a 1-minute video briefly featuring several Wyoming (roadside) attractions. We stopped at the Wyoming welcome sign and the Tree Rock - impressive because there are no other trees around, just the one that decided hundreds of years ago to grow out of a few rocks, of which there also aren't that many right in that place. 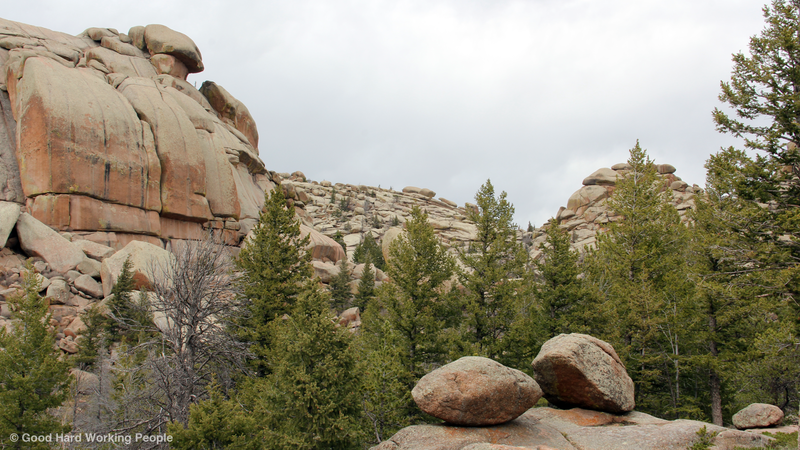 But once we walked into the Vedauwoo Recreational Area (located in the Medicine Bow-Routt National Forest), it became quickly clear that we'd spend the rest of the day there instead of making our way to further destinations. All we had time for (before returning to Fort Collins for some walleye night-fishing) was the Ames Monument, which you can see at the end of the video. It was my first pyramid sighting, besides the one at the Louvre in Paris. I'm still working my way up to the Mayan and Egyptian pyramids... This Wyoming pyramid was built to honor Oakes and Oliver Ames, Jr., who were major financiers of the Union Pacific Railroad. By the way, people have been telling me how windy it's always up in south-eastern Wyoming and especially around Vedauwoo. But for us North Germans who are used to the "Starke Briese" from the North Sea, it really didn't seem all that windy. The music in this video is the instrumental version of "Go" by Josh Woodward (http://JoshWoodward.com). The song is licensed under a Creative Commons Attribution 3.0 US License. Because this is my 4-year anniversary episode, I would like to thank all of you again for watching and for continuing to watch (and comment and share). You're what makes this whole endeavor so rewarding!